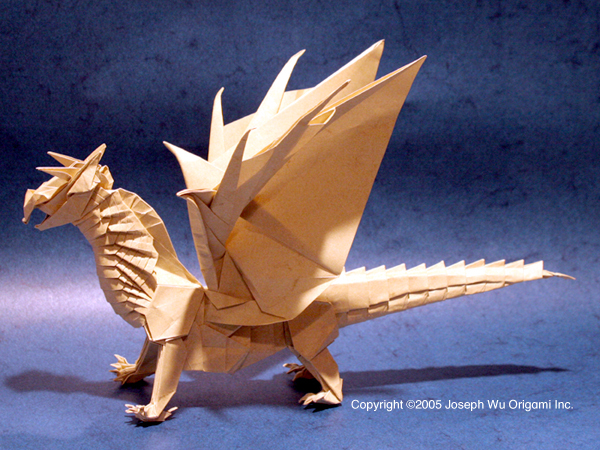 Folded from five-and-a-half sheets of equal-sized square paper (head & upper neck [half sheet]; lower neck, chest, & fore legs; haunches & hind legs; tail; left wing; right wing). This design is based on the lion design I did for PCM in the Netherlands. I recently had to reconstruct that lion for another client, and I started thinking about making other creatures using the same basic structure. My first attempt, a gryphon, is still a work in progress, but this dragon flowed naturally from the gryphon design, and was much more successful. The form of the dragon is based on the feline dragons introduced in the 3rd edition of Dungeons & Dragons. This design incorporates a number of different folding and design techniques, including tessellations (for the scales), wet folding (for the claws), and dry tension folding (for the torso, tail, and wings. It is folded from elephant hide (elefantenhaut) paper, which works well for both wet and dry tension folding. The locks between the parts are especially strong, making this a very sturdy model. The finished dragon measures 38 cm (approx. 15 inches) from nose to tail.